As we wait around for Justin Bieber to piss in another mop bucket, the celebrities of YouTube are showing us all what it means to be the worst people on the planet. You may feel like Norm Macdonald at the YouTube Big Live Comedy Show when kids start dropping names like Austin Jones, DaddyOFive, and PewDiePie, but considering one’s an alleged predator, another a child abuser, and the third one an anti-Semite, that’s probably a good thing. While kids will be kids, Paul’s antics aren’t charming to his new neighbors, who would rather not see couches set ablaze in empty swimming pools outside their bedroom windows. A news anchor from KTLA 5 caught up with a few of them, as well as with Paul himself, who here proves he is more meme than man. When asked about his neighbors’ anger at the “war zone” he’s created, Paul says, “It’s terrible, it’s a bad situation, and I feel bad for them, but there’s nothing we can do. 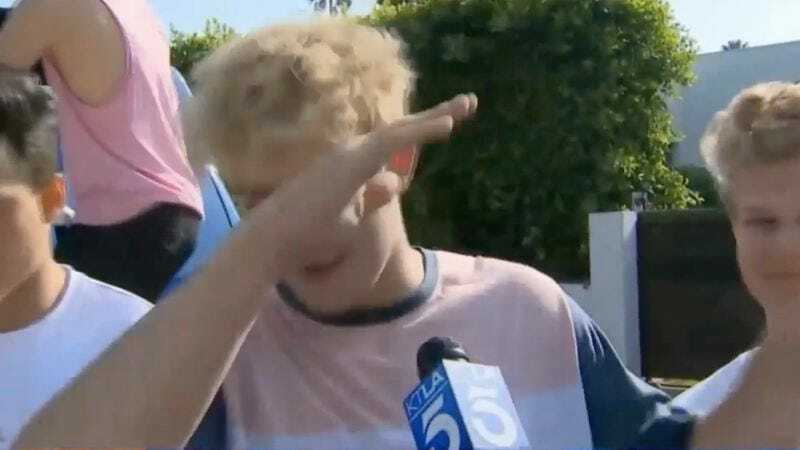 Jake Paulers are the strongest army out there.” His bleating cronies hover behind him, splaying their bodies across the KTLA 5 news van as their fearless leader dabs and screams, “What are thoooooose? !” at the hapless news anchor, a reference to one of the countless memes that has replaced sincerity and basic human decency in the kid’s brain. The clip also finds Paul revving a dirt bike and squealing down the street to the adoration of dozens of screaming preteens, all of whom he more or less invites over by broadcasting his home address on social media. His reign of terror may be short-lived, however, as the neighbors are planning to meet with local officials soon to decide whether or not to file a class-action nuisance lawsuit. Not even a well-timed dab can stop one of those.